Ok, you probably thought I fell off the face of the earth right? Nope, there is just alot happening around here. The next event is Beckie's Baby Shower this Sunday. 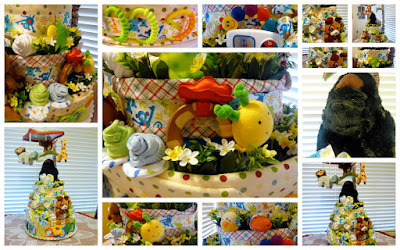 Decided to make my very first Diaper Cake and these are just a few of the pictures. The first thing I did was watch about 20 YouTube videos describing how to do it. Then I bought my supplies and put it together roughly first then more refined about a day later. This is a close up of the baby sock roses with mitten leaves. Yes, that video DOES exist! Next is a close up of wrist rattles and a little caterpiller radio that makes soothing sounds for baby. Background ribbon is from WalMart and the blanket set is from the Jungle Adventure Collection at K-mart. The topper for our "Jungle" themed cake is a Silver Back Ganz Gorilla. These little links slipped easily over the ribbon and added a little extra bling to the sides of the cake. Each layer consists of diapers along with extras like washcloths, burp pads and Onesies. For my first cake ever I was pretty happy with the results. Something tells me it won't be my last.